03 Jan Session Share: Making Memories! Inspiration: My soul inspiration is always the same. My clients. These four beautiful faces. I had met Dad on a commercial assignment I had for a local high tech company. He asked me if I photographed families.That was a big YES! He told me how wonderful his family was and how beautiful his children were. His excitement to share my information with his wife was so sweet. Our first session was derailed with an all day rain. Our next date was at the end of October on one of the most beautiful fall days. The love this family has for one another is inspirational and and their kindness overwhelming. I wanted to be sure to capture that for them. Favourite element: I love the light in this session. We were blessed with so many sunny days in Ontario this year and that I was grateful for. 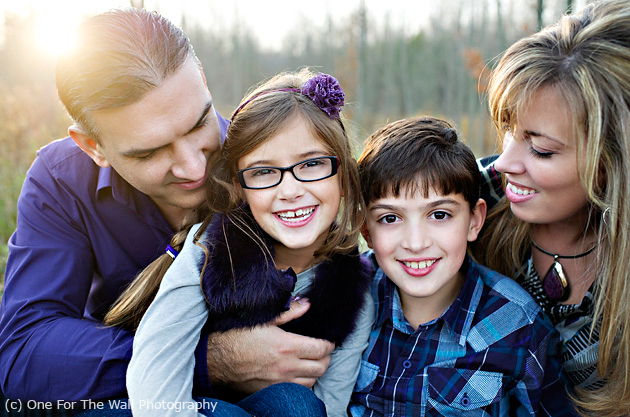 Biggest challenge: The biggest challenge is always wanting to capture who that family is. Translating what I see and feel about them into a photo. Photographers Final Words: I would like to share this with you. Something I wrote on my Facebook page that sums up how I am feeling towards the photos I have of my own family and those of the families I work with since the events of last Friday. “And now back to the reality of today. That reality that sits in the back of our minds and in the pit of our stomachs all day. The reality that we all wished was only a really bad dream when we wake in the morning. I know a lot of people struggling with the deaths of those innocent, beautiful young people last Friday and I am one of them. As I emptied the mailbox today with my usual excitement of the Christmas card season I found myself looking at each of the photos on those cards in a different light. One in particular hit me. Hard. I stared at it for a long time. I sat and cried in my car. (In my car because, like a child, I cannot wait to get home to open them) Mom, Dad and son. Embracing. Smiling. Loving. Trusting. Believing. Hoping. Hold onto your memories, hug your photos and know the world is grieving with you. These images are simply beautiful. Hilary is not only an incredible photograpgher, but a truly amazing human being as well. These are beautiful images. Hilary is not only an incredible photographer, but a wonderful human being as well.